An epic journey, with stunning backdrops. The Luang Prabang to Chiang Mai by slow boat. 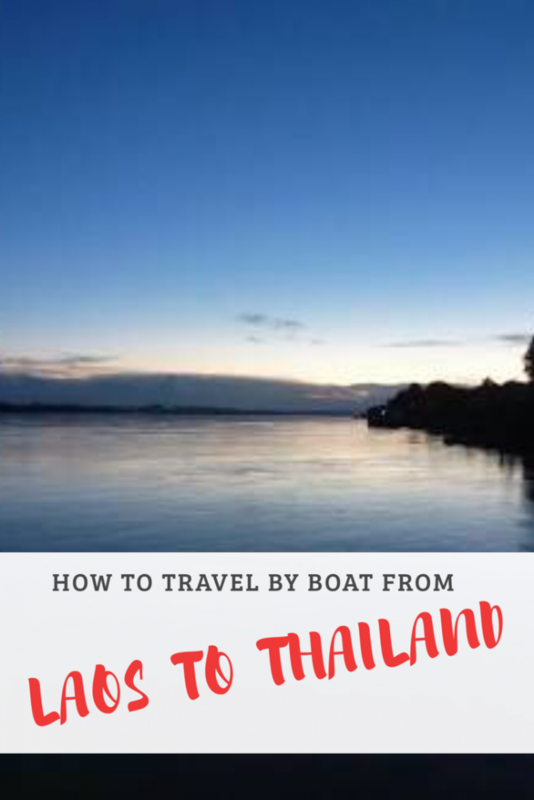 Before I made the epic slow boat journey, I was looking for the best way to get to the Thailand border from Laos. I even considered a soul destroying 20+ hour bus ride from Luang Prabang to the North of Thailand. No, on this one I can’t handle a cramped, stuffy and travel-sick-bound bus ride. And why would you choose that when you can ride the amazing slow boat ride from Laos to Thailand. Best decision I’ve ever made cruising the river Mekong to Thailand on sweet flat waters, with the most stunning views all the way. It’s funny I’ve never been to the Amazon, but I felt like I was on a cruise through the famous Amazon rainforest. 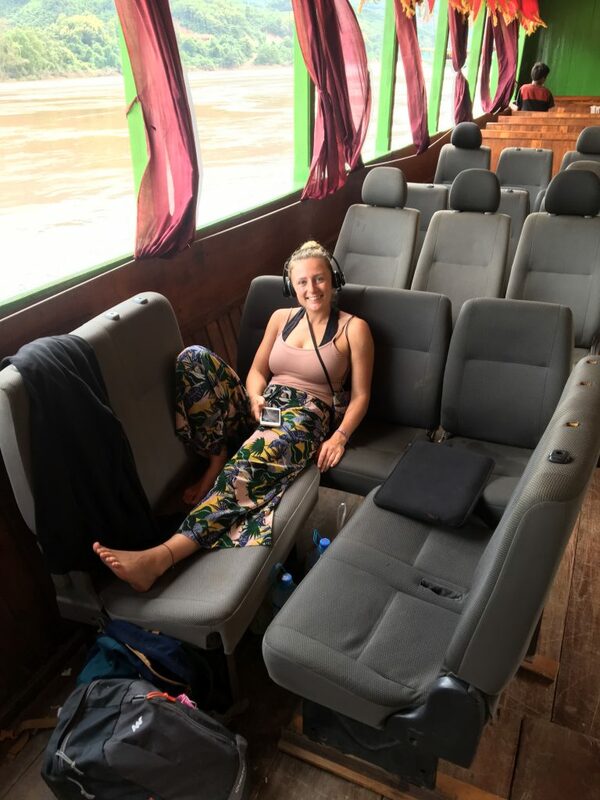 Okay, I am going to tell you everything you need to know for how to get from Luang Prabang to Chiang Mai on the slow boat and everything you need to make it a memorable 20 hour slow boat journey on your backpacking trip through Southeast Asia. You should organise your transport to the slow boat pier the day before you set off. 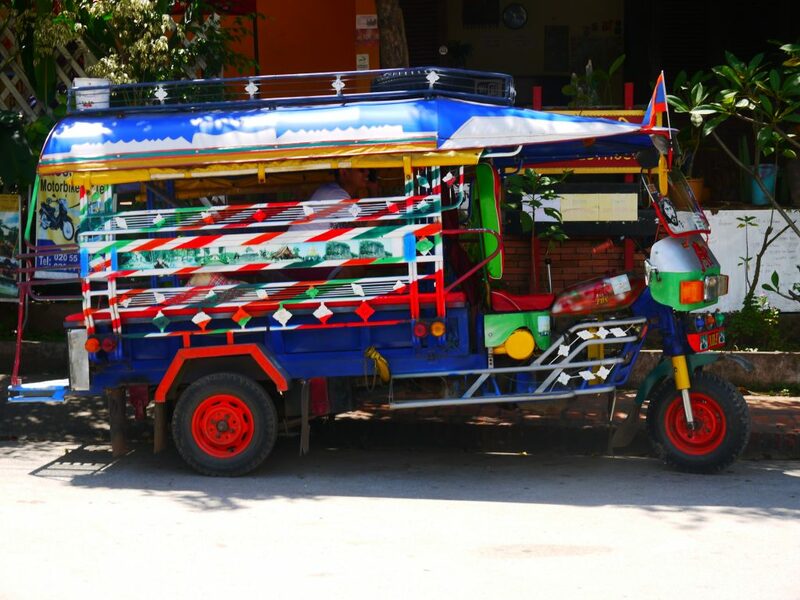 A tuk tuk is the best way to get from the centre of Luang Prabang to the pier. The pier is 7km away from the centre, give or take a kilometre depending on your location. The cost of the tuk tuk is 50,000 kip ($8) and that price was for two of us, the driver will start with a higher price and you will have to barter for the price (but they expect this) and there are plenty of tuk tuks parked on the streets. You shouldn’t book it through your hostel as we found the prices to be higher. 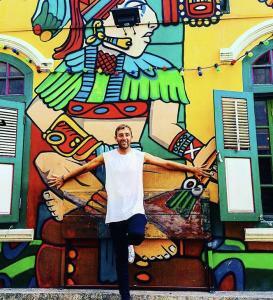 What time to get the tuk tuk? Have him pick you up around 7:15am, this will give you 25 minutes to get to the slow boat pier and then the ticket office opens at 8am. What about breakfast? We had to leave before our hostel free breakfast service started, however we told our hostel in Luang Prabang the day before and they prepared egg and baguette to take with us. “Sweeeet”. You will be able to buy tickets from your hostel for the Luang Prabang to Chiang Mai boat ride, however it’s cheaper to buy them directly from the ticket office at the pier. Also, the ticket is for the day 1 boat ride from Luang Prabang which costs 110,000 kip ($15) per person. 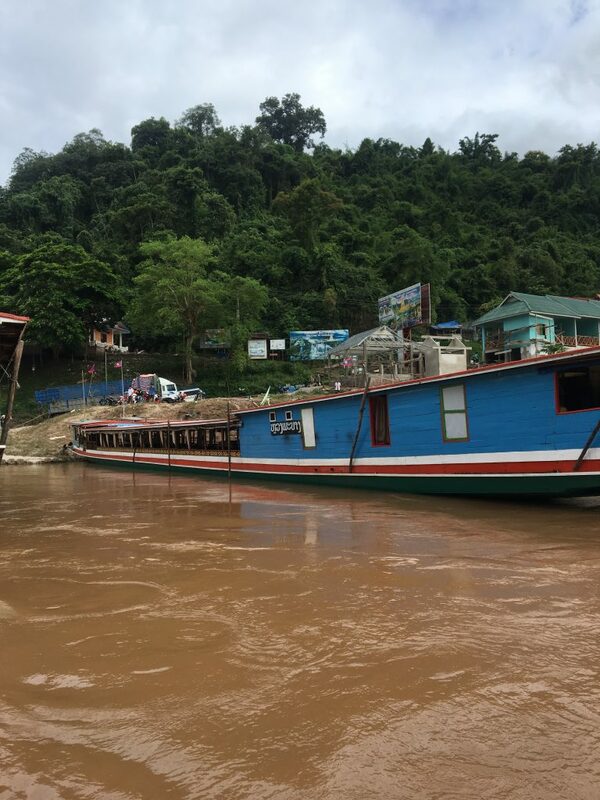 How long does the slow boat take from Luang Prabang to Pak Beng? The boat ride from Luang Prabang to Pak Beng takes 9 hours, but don’t worry it doesn’t feel like a long 9-hour journey. 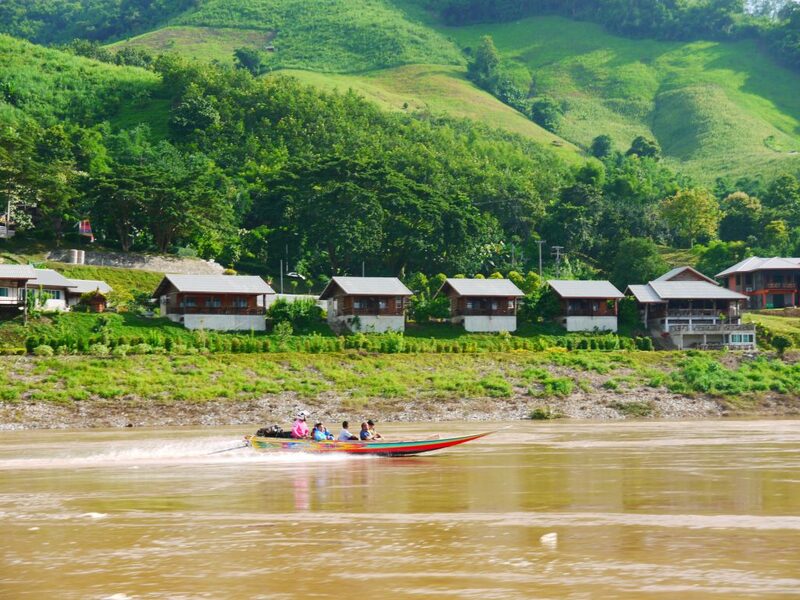 You will enjoy an unbelievable ride on the river Mekong, taking in the most epic views every part of the way. Also, the journey from Luang Prabang to Chiang Mai is not as popular as the boat ride from Chiang Mai to Luang Prabang. Therefore, we all had a row of seats to ourselves which is happy days to just put your feet up and chill out. Along the way we got speaking to the few other passengers on the boat and this is a great way to share backpacking tips and listen/share funny travel stories everyone’s experienced. Also, I got speaking to a Laos local and I learned some interesting facts about his culture. This Luang Prabang to Chang Mai slow boat journey is amazing. On arrival we expected lots of locals stood there like mere cats trying to entice us to stay the night at stay at their accommodation. However, it was nothing like this and there were only a few people with cheap made pictures of their homestays. Nevertheless, we chose to stay at a place that is a 2-minute walk from the pier. It’s probably one of Pak Beng’s closest places to stay near the pier. The cost of the private double room was 40,000 kip ($6) per night for two people, which is a fair price. We had a meal that night and each meal was around 20,000 kip ($2.50) and I had a fresh muesli breakfast the next morning for 25,000 kip ($2). Also, the homestay will prepare anything you want to take for dinner on the Thai slow boat. There are plenty of places to stay in Pak Beng and you won’t have any trouble trying to find a room. The next morning, we had breakfast at 7:30am then made our way to the pier for 8am to leave on the boat for 8:30am. You need to buy your last boat ticket on arrival to the pier and this cost us again 110,000 kip ($15) per person for the 8-hour boat from Pak Beng to the Thai border. We expected the pier to be busy and the boat, but we were surprised how quite it was and even more surprised there was only 7 of us on the boat from Pak Beng to Chiang Mai. Again, we got to sit anywhere on the boat and had enough seats to make a bed like structure, winning. How to get to Chiang Mai from the border? We decided to get a 5 hour bus the next day, there was no way we was going to carry on travelling for 6+ hours. However, you can get a minivan the same night to Chiang Mai, but the bus the next day is a lot cheaper option! I found out this information from the local I got chatting with on the boat that there are strong whirl pools on always along the Mekong river and you can actually see them every few metres up the river. But don’t worry the slow boat captains know the route like the back of their hand. The toilet is pretty rough and is worse on the second day boat ride, this probably affects girls more. The room is dark and wet. I guess we can’t have everything perfect like the Mekong river views. The boat ride from Luang Prabang to Pak Beng takes just over 9 hours, not 8 hours like the ticket office tells you. You will stop off at a few villagers to transport goods and locals, but it’s cool to see the local villages as they look like mega quirky jungle houses. Have all your electrical charged from the night before. I charged my laptop, battery pack, phone and wireless earphones. Then, you gotta make sure they’re all on low power mode! Then just be savvy to save the power i.e. take a break every now and again or read your book. This is a key tip for the slow boat, take your own food and drink. We had ham and cheese baguetts made before the Mekong journey. We chose ham and cheese as it will probably last longer than say avocado. Also, take your snacks on such as fruit, crisp and toffees. You need a few munchies for along the way and we also took on-board 3 big bottles of water between 2 of us. 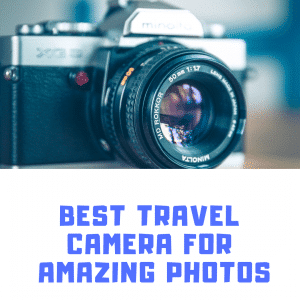 The pictures I have include in this post are all taken along the epic boat ride from Laos to Thailand and you have the opportunity to grab take yourself some sweet snaps. People say take hoodie and pants on due to the cold wind in place along the rive Mekong, however mine just got used as a pillow. But I would recommend taking them just in case it does get a little chilly. If you have a Netflix account, download the app and then download some movies to the app. This way you can watch your favourite movies offline and this will pass a good chunk of time on the slow boat. 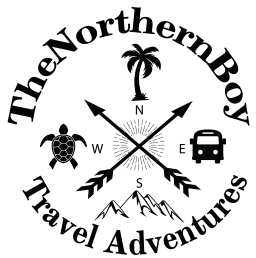 Other than that I hope this how to get from Laos to Thailand has given you all the information you need and have an epic ride along the way.